Whether your child plays video games on a portable unit, a television or the Internet, excessive gaming can affect his life. Video game addiction can be as problematic as gambling and affects players as young as 8 years old, notes Keith Baker, director of Smith and Jones Addiction Consultants, in an article for Brigham Young University’s NewsNet. Be aware of the effects of a video game compulsion to keep your child's hobby in check. He shouldn't be getting anymore than two hours of screen time per day and this includes time playing games, watching television and surfing the Internet, according to HealthyChildren.org. A video game addiction can be harmful if your child is unable or unwilling to participate in any interests or extracurricular activities other than gaming. The On-Line Gamers Anonymous website notes that it may be a sign of an addiction if your child is constantly thinking about his next video game session, devising ways to get back to the game, abandoning former hobbies that don’t relate to video games or declining social events with personal interaction because he's spending time discussing video games on the Internet. 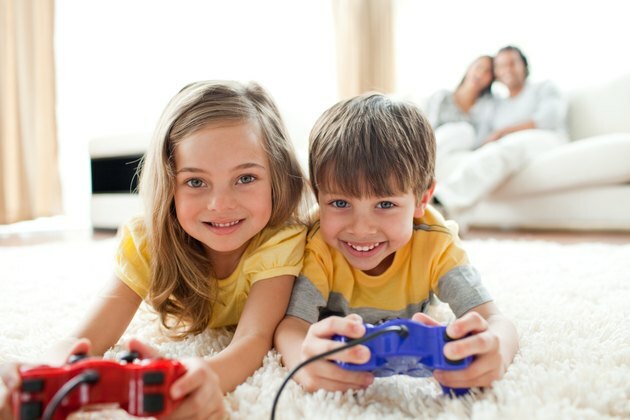 If your child spends all of his free time playing video games and skips meals or loses sleep because of excessive game play, a video game addiction can negatively impact his health. Children who spend more than two hours a day in front of a television or video games in lieu of participating in physical activity may suffer from childhood obesity. In addition, the University of Texas at Dallas notes that the addiction can lead to such medical issues as backaches, headaches, eyestrain and carpal tunnel syndrome--pain and numbness that your child may feel in his wrists, hands, shoulders and elbows. Relationships with friends and family members may suffer if your child is spending more time gaming than he is talking to or going out with loved ones. The On-Line Gamers Anonymous website notes that gaming may be negatively affecting your child's life if he only wants to talk about video games, lies to cover up the amount of time he spends playing, and argues with you over his excessive gaming. Video games that feature violent actions and scenarios may lead addicted players to be desensitized to the violence. Richard Gallagher, director of the NYU Child Study Center’s Parenting Institute, states that players who become engrossed in first-person shooter-style video games, for example, may adopt a detached view of society or develop aggressive thoughts and tendencies. Long hours playing video games can negatively affect your child's performance in school if he's preoccupied with video games. He can fail to work at his optimum level because he's exhausted from a late night of video game playing. If your child devotes more than one or two hours a day to television or video games, he may have trouble falling asleep, have problems paying attention and have lower test scores than other children who don’t spend as much time in front of a television or video game console.